The latest smart phones are becoming sources of utter obsession for the new generation, and a complete nuisance for teachers. While the Gen X spends most of their time doing something more “constructive” that requires activity, they can’t help wonder what will become of the Gen Y whose eyes always seem to be glued to their smartphone’s screen. It is really a pitiful sight when you see a teacher going on about something the students should be learning while the students, yawning away, resort to their cell phones to kill time. According to the PEW research done in 2011, cellphone owners in the US between the ages of 18 to 24 send and receive an average of 109.5 messages per day, which is about 3000 messages per month. That’s A LOT! And it seems to be increasing. Banning the cell phone during class may be a good idea, but at a certain point, it becomes hard to control. You can’t watch what every child, in a class of 30 or so students, is doing behind the desk. Besides, once they’re in college, it’s all in their hands. 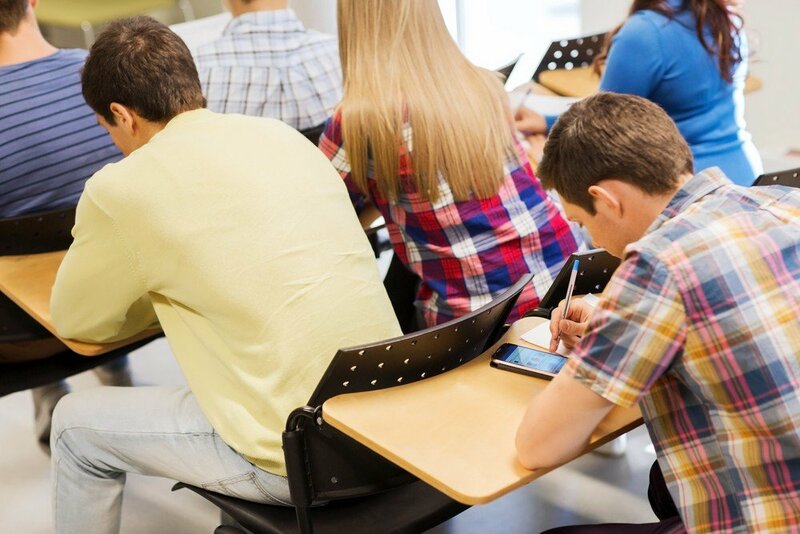 Cellphones can be a major source of distraction in class. How about turning the distraction into a source of engagement that actually enhances learning and productivity? After all, it a very powerful ubiquitous tool which can be used in various ways. So, why not distract the student from their off-topic SMSing and replace the use of this device with something that actually relates to the class and engages them? You can actually encourage the use of a cell phone and turn that divertissement into an educational tool by using these techniques. Why not make use of their handy dandy cell phone by asking them to research on a particular subject? Ask them to find the history of something and answer a certain question. Give them bonus marks on whoever answers the question first. They’ll switch from texting their friend to typing away in their search engines. When a problem student continues to interrupt class, give him five minutes to Google what he can about a concept being discussed and present the knowledge to class. That way, you’re encouraging him to learn something himself instead of wasting his time, as well as others. They’ll forget the calculator at home, but they’ll NEVER forget the cell phone. You can actually use this to your advantage. Previously, when a student would forget to bring his own calculator he would ask his nearest classmate to let him borrow. This is actually counterproductive since each has to wait his turn before he can make the calculations, slowing the learning process. Nowadays, every smart phone is embedded with a handy-dandy scientific calculator. Ban the borrowing and instead, encourage them to use their cellphones. Celly is a great app that can be used for educational purposes and in the class environment. With the help of Celly, classrooms can take quizzes, get news/updates, take notes, and organize study groups. It also enables students to share their thoughts with their peers or teachers regarding the class topics. This is a great app that allows teachers to send their parents or students messages and emails without sharing phone numbers. If the parents need informing about their child’s behavior, the teacher can just pop an email with confidence. Then there’s the best part: it’s free for teachers! Why not boost studying with study boost?! This app allows students to study through sms-based quizzes. Teachers can make multiple choice or open-ended questions and take quizzes using the instant messaging service. Need a poll in the class? Use Poll everywhere to give your students questions which they will be able to respond to using their mobile phones, twitter, or web browsers. The app will quickly calculate the results and compile it into a PowerPoint presentation right away. This doesn’t mean that the cell phone is all of the sudden the-best-device-around in class. There have to be certain limitations on how students should be using their devices, especially in a classroom environment. However, all the students will carry their cell phones to class inevitably. So, why not put that piece of distraction to some good use?